It’s easy to see orangutans in sanctuaries around Borneo, but you need a little more planning and luck to find wild orangutans. 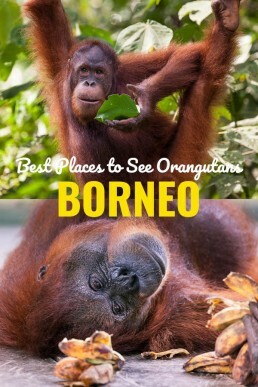 Check our list of the best places to see orangutans in Malaysian Borneo! Each of these orangutan destinations has its pros and cons regarding logistics, lodging and, of course, the scale of wilderness and ease of spotting the wildlife. Sungai Kinabatangan aka Kinabatangan River offers the easiest and most frequent sightings of wild orangutans. Kinabatangan is the second longest river in Malaysia, expanding 560 kilometers from the mountains of Sabah to the Sulu Sea. 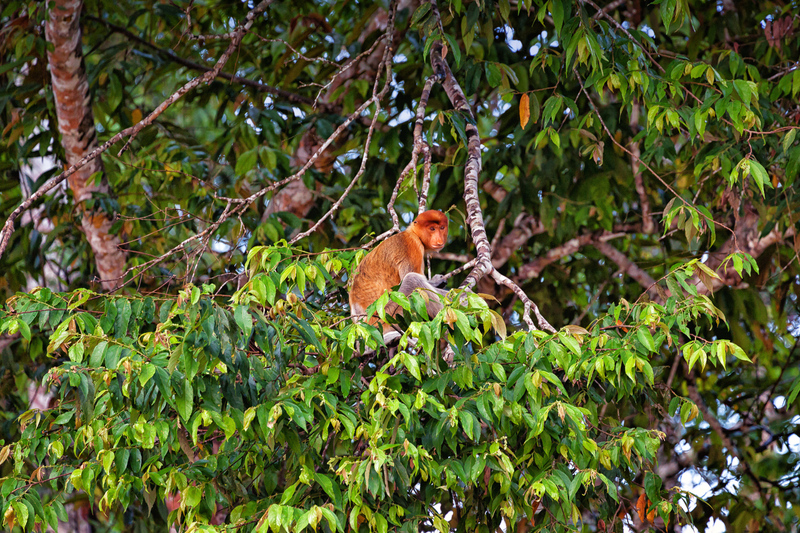 Kinabatangan’s northern banks have some of the highest concentrations of wildlife in Southeast Asia. During just one day, we spotted six wild orangutans in Kinabatangan. For us, the up-and-close orangutan sightings on Kinabatangan were the best we had in Borneo. But orangutans are just a part of the spell here. Mornings start with a cruise when mist wraps the jungle in the fairytale-like gown and the sounds of jungle promise exciting discoveries. We loved observing packs of wild proboscis monkeys, built a love-hate relationship with the mischievous macaques, laughed at the wild pigs who charged us during our jungle hike, and visited the seventh heaven for spotting the rare pygmy elephants on the water’s edge amidst thick vegetation. 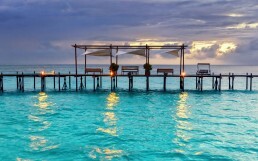 Check out these amazing itineraries in Sabah and start planning your trip! Fly, drive, or take a bus to the city of Sandakan. All Kinabatangan tours start from there and include return transport. Booking a guided tour to Kinabatangan is your best bet, as most lodges are owned by tour companies. It’s possible to drive to Sukau independently, but we would rather recommend boat travel from Sandakan to Sukau, as that way you’ll see more – and have a chance to see orangutans also during the transfer! Orangutan sightings are frequent: the best place in Borneo to photograph wild orangutans! Narrow wildlife corridor makes it easy to spot wildlife, but the core message is sad: animals are forged too close to villages and cannot really avoid confronting civilization. Sukau area feels crowded with tens of lodges and loads of boats cruising the river in the hunt of the orangutan sightings, so prepare to share some of the sightings with other boats. Abai area has fewer tourists, but more local houses and fewer wildlife encounters. Extensive logging has disrupted much of the ecology. Palm oil industry lurks right behind the corner if you leave Sukau by road. Added bonus: Sukau area boasts good chances to spot the Bornean pygmy elephants! Budget accommodation is widely available and independent travel is possible, unlike in all the other wilderness destinations listed below. 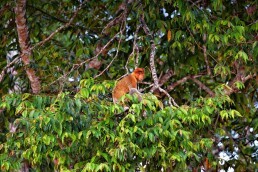 Orangutan spotting hardly gets better than in Kinabatangan River, where you can also see proboscis monkeys! Danum Valley is the wildest place on earth where you can spot Bornean orangutans. By wildest I mean the real, virtually untouched wilderness. 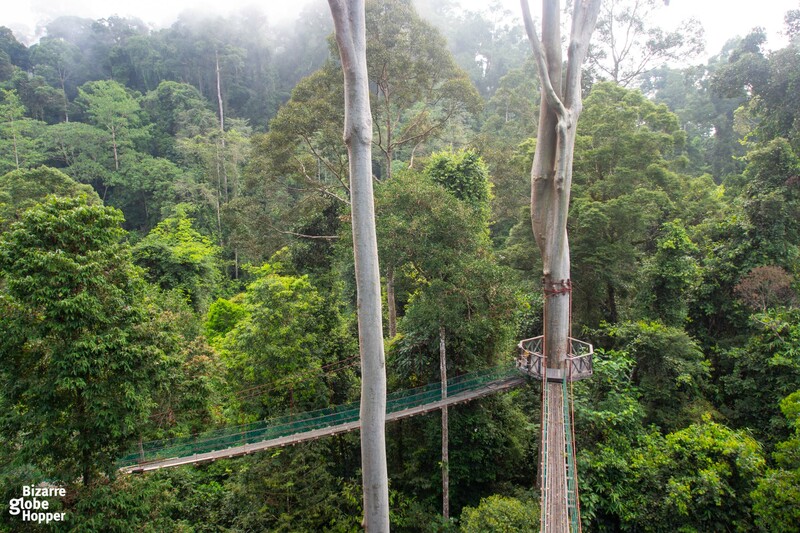 Danum Valley Conservation Area is the last stronghold of primary rainforest in Borneo and the largest area of undisturbed lowland dipterocarp forest in Sabah. Here the trees are 70 meters tall and wildlife you encounter spend the majority of their time further in the heart of the protected primary forest, where no modern man has stepped. Seeing wild orangutans in Danum Valley is an exclusive, once-in-a-lifetime experience. 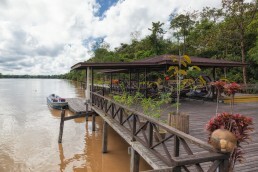 There’s only one hotel, the award-winning Borneo Rainforest Lodge with just 30 luxurious chalets. It’s a paradise for naturalists, birders, and nature photographers. You will live inside the vast home of orangutans and other wildlife: Borneo Rainforest Lodge is Borneo’s only hotel, which lies inside the primary forest. Orangutans had slept right upon our chalet the night before we arrived! Fly in Lahad Datu from Kota Kinabalu (one hour). The adventure begins with a complimentary 2-hour jeep transfer inside Danum Valley Conservation Area: we managed to see a herd of the rare Bornean pygmy elephants during both drives! Much like Danum Valley, Tabin Wildlife Reserve offers exclusive encounters with wildlife in their natural habitat. In the lowland dipterocarp forest and mangroves of Tabin hide seven of Sabah’s eight primal species, among them orangutans in relatively low numbers. However, Sepilok Rehabilitation Center translocates rescued orangutans in Tabin, which makes orangutan spotting a lot easier. Fly in Lahad Datu from Kota Kinabalu (one hour). 1-hour road transfer from Lahad Datu to Tabin is included in the accommodation prices. You can also opt to drive (4×4 required) from Kota Kinabalu (8 hours), Sandakan (5 hours) or Tawau (5 hours). The biggest state of Malaysian Borneo, Sarawak, has lesser reputation in wild orangutan spotting than Sabah. The good news is that Sarawak has also less visitors than its sister state, making wild orangutan spotting a real adventure. Batang Ai National Park is the best place in Sarawak to spot wild orangutans – it’s also practically the only place. Batang Ai belongs to the Borneo’s largest – and first – tropical forest transboundary biodiversity conservation area. It’s claimed as the most important orangutan sanctuary in Borneo: up to 10% of Borneo’s wild orangutan population calls these staggering 1.1 million hectares of land their home. Most tourists book their visit through a tour company when transfers are included in the package. Batang Ai is around 275 km and a 5-hour drive from Kuching. The park is centered around Sarawak’s largest man-made lake and entrance requires taking a motored longboat from either Aiman Batang Ai hotel’s jetty or the public jetty (no public boats available, so prebook the transfer). The boat trip takes around 2 hours. Seeing orangutans depends heavily on luck, but that’s true to Danum Valley and Tabin, though we saw several orangutans in Danum Valley. Rich cultural experiences at your fingertips: Batang Ai is also the best place to visit old-time longhouses and get to know Iban people, Sarawak’s largest ethnic group. No accommodation inside the park. Nearby options are limited to traditional longhouses and Aiman Batang Ai Resort & Retreat (previously Hilton). Professional photography requires a permit. The southern part of Borneo, called Kalimantan, belongs to Indonesia. Tanjung Puting National Park in the Central Kalimantan is the best destination in Indonesia to meet rehabilitated orangutans in the wild. The national park is explored traditional, two-story klotok boats, which stop at orangutan feeding stations. Getting to Tanjung Puting is a bit trickier compared to above-listed orangutan destinations in Malaysian Borneo. Fly from Jakarta to Palangkun and book a tour including riverboat transfers: a boat is the only way to access Tanjung Puting. 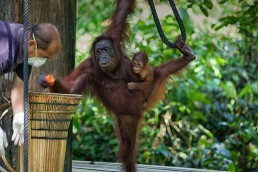 You can also visit word-famous orangutan sanctuaries in Sabah and Sarawak to meet semi-wild and rescued orangutans. We visited – and loved – both Sepilok’s Orangutan Rehabilitation Centre and Semenggoh Nature Reserve in Sarawak. 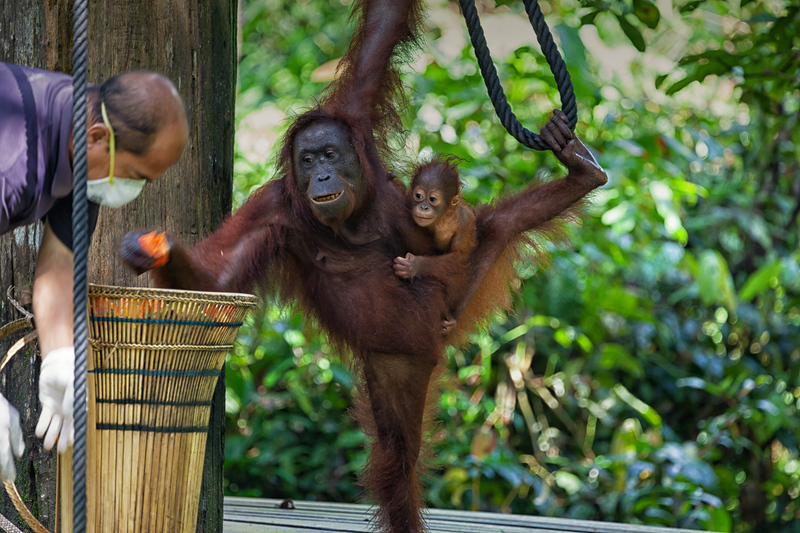 Both facilities offer almost guaranteed chance to see orangutans during their feeding times. I highly recommend adding at least one orangutan sanctuary into your Bornean itinerary, as it doubles your chances to see the great apes and gives back to orangutan conservation. Although the orangutans are not exactly wild, it’s still an impressive sight to witness them swinging along rainforest canopy towards the feeding platforms. Get inspired by our 2-week route in Borneo, which can be easily be adjusted into 1-week or 3-4 weeks itinerary. Our route covers Kinabatangan River, Danum Valley, and the orangutan sanctuaries of Sepilok and Semenggoh – with some other exciting attractions. 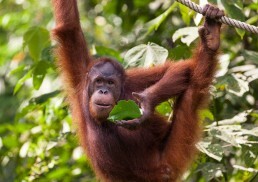 Check it here and start planning your orangutan holiday in Borneo! Feel free to visit Borneo’s orangutan sanctuaries around the year, as orangutans are likely to pop at the feeding platforms unless torrential rain keeps them in the forest canopy. The dry season runs from March to October, which is considered the best time to visit Borneo; it’s also the best time to see orangutans in the wild. Still, please note that it might rain anytime, as you’re in a tropical rainforest. Orangutan sanctuaries get crowded during school holidays, so it would be best to avoid those timings if you can. Obviously, all orangutan destinations listed here offer ethical encounters with orangutans. Sepilok Rehabilitation Center and Semenggoh Wildlife Center both respectively take care of orphaned and illegally caught pet orangutans and injured adult orangutans. Entrance fees support their conservation work. Please, never ever support “a self-claimed orangutan sanctuary” where orangutans are kept in small cages or leashes, required to do tricks, or where these great apes look stressed, mistreated or unhappy! Also, never touch, feed, or play with an orangutan (unless you’re volunteering and liable to do so). Orangutan observation has its own guidelines, but using common sense brings you far. We listed below the common rules of visiting orangutans, but please listen to your guide’s instructions in all situations. You must stay on marked trails and obey all the other rules that the sanctuary or national park has. Do not approach, feed or try to touch orangutans. If orangutan approaches you, move away slowly if you can and listen to your guide’s instructions. Don’t use flash while taking pics. Don’t shout or make sudden movements or otherwise agitate orangutans. Don’t stare orangutans into the eyes: they might feel charged or disturbed. Never go between two orangutans – especially a mother and her baby. If you hear kiss-squeak sounds or if orangutan drops vegetation or food upon you, it’s stressed or angry. Back off. Cancel your orangutan observing activity if you’re ill, because of the risk of spreading diseases to orangutans. If you need to cough or sneeze, turn your head away from the animals and cover your mouth and nose. 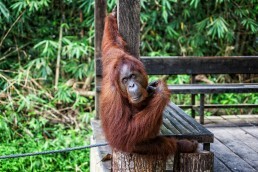 Simple flu to humans might be fatal to orangutans! Eating and drinking near orangutans are generally not allowed. Smoking is prohibited, as it disturbs animals and cigarettes might transmit diseases. A recent study recorded a saddening 50% decline in Borneo’s orangutan population. During just 16 years between 1999 and 2015, we’ve lost roughly 150 000 individuals. The greatest surprise for us was that up to 70% of the loss might be caused by hunting and other killings by farmers. Habitation loss by palm, paper, logging, and mining industries is only a part of this tremendous tragedy, though the most severe losses were recorded in the areas where habitat was destructed. We as consumers can help to save their habitat by choosing products, which don’t use palm oil. 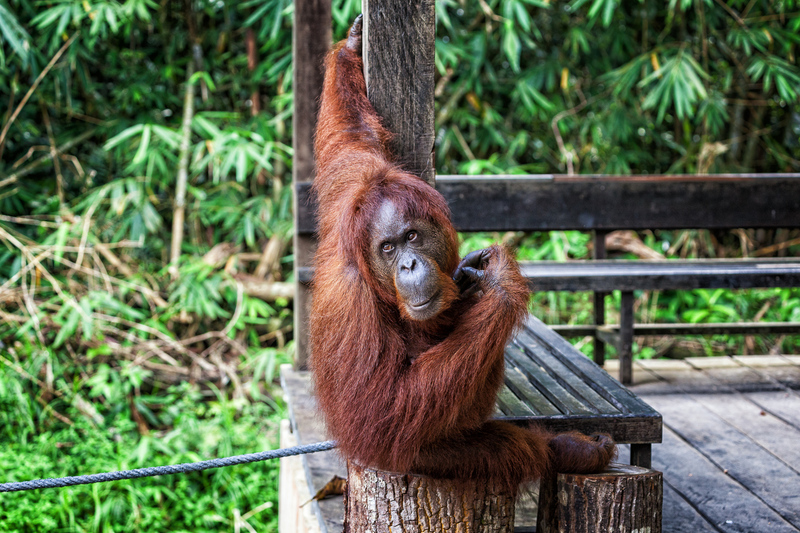 If you’d like to donate to orangutan rehabilitation and conservation, The Orangutan Project (EU/AUS) and Orangutan Appeal (UK) are both solid options; the latter funds projects at Sepilok’s Orangutan Rehabilitation Centre. Wild orangutans live only in the islands of Borneo and Sumatra. Orangutans are divided into three species, Borneo Orangutan (Pongo pygmaeus), Sumatran orangutan (Pongo abelii) and the recently discovered Tapanuli orangutan; all species are critically endangered. The Borneo Orangutan has three sub species: P. p. morio living in Sabah and East Kalimantan, P. p. pygmaeus living in Sarawak and West Kalimantan, and P. p. wurmpii roaming West and Central Kalimantan. Thus, the orangutans that in Kuching’s Semenggoh Sanctuary or Batang Ai are different species than those you’ll see in Sabah, either in Danum Valley, Tabin, or Sepilok Orangutan Rehabilitation Center! “Orang utan” means “man of forest” in Malay and Indonesian. We share 97% of DNA with orangutans. 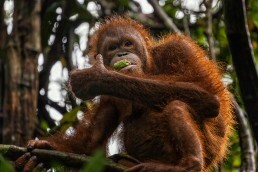 Like us, also orangutans have opposable thumbs and big toes. Bizarre fact: a third of orangutans don’t have nails on their big toes! Orangutans are adapted to eat, sleep and move in the trees – they spend more than 95% of their lives in the forest canopy. To facilitate smooth swinging and hanging, their arms are longer than the rest of their bodies. Male orangutans weight 50-100 kilos and females 30-50 kilos, making them the largest arboreal mammals on earth. Current researches estimate that there are only 55 000–100 000 wild orangutans living in the rainforests of Borneo. If you have you seen wild orangutans in Borneo, please share your experiences in the comments below! Danum Valley offers the most authentic wildlife encounters in Borneo, and it's the best place to see the rare pygmy elephants. 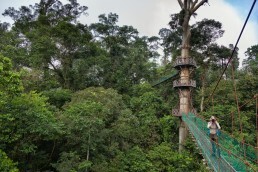 Famous canopy walkway gives a bird-eye view to the most complex ecosystem in the world: the primary rainforest, the home of truly wild orangutans.